This Double Peanut Butter & Chocolate Cheesecake with Pretzel Crust is everything you would expect. The creaminess of cheesecake, the rich, slow-chew of peanut butter, sweet dark chocolate and the buttery crunch of salted pretzels! It is especially good when served cold. One small slice is very filling so enjoy every bite of decadence. 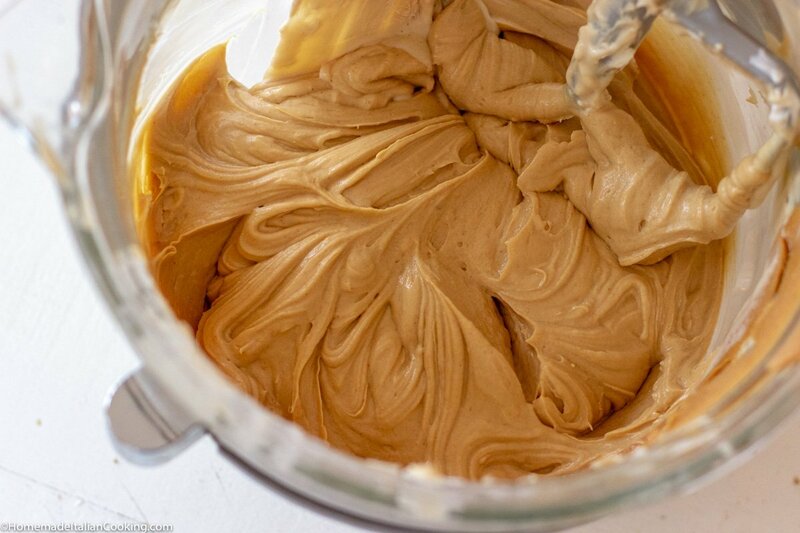 This recipe is heavy on peanut butter, and some may think it overpowers the cream cheese. If preferred, cut back on the PB for a more milky sensation. There are many way to make cheesecake. This version uses a low oven (200 degrees so not to burn the pretzel crust) and let the cheesecake set in a turned off oven for a long time. I choose to skip the water bath method because of the springform pan. It is easiest to remove a cheesecake from a springform pan, however a springform pan in a water bath risks leakage. Two additional tips: use good quality chocolate for the ganache and be sure your cream cheese, sour cream and peanut butter are room temperature before mixing. 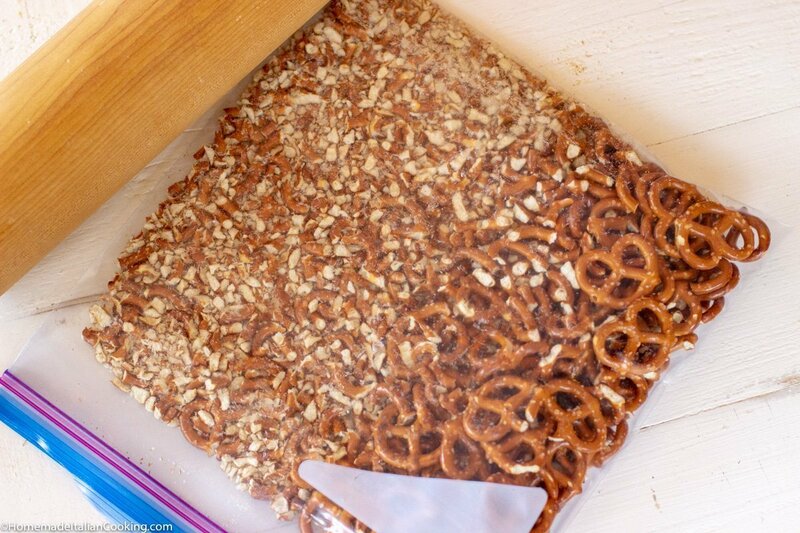 Crush the pretzels in a ziplock bag with a heavy rolling pin. 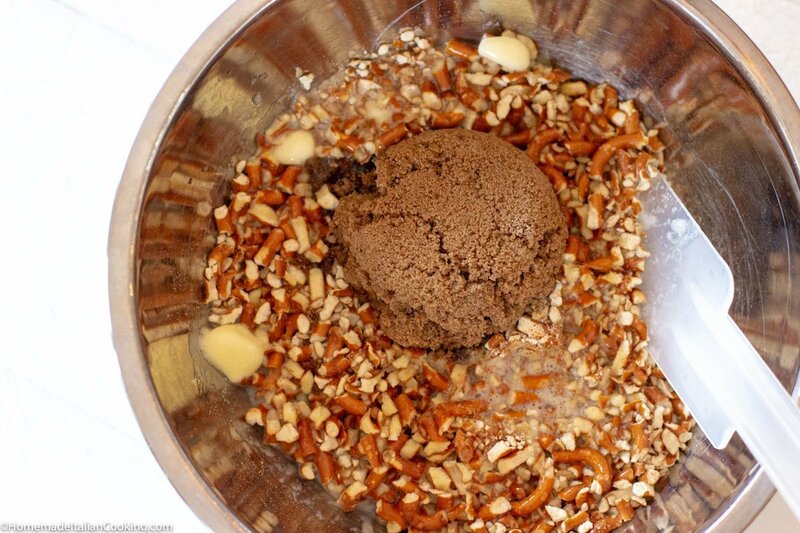 Mix the crushed pretzel with brown sugar and melted butter. 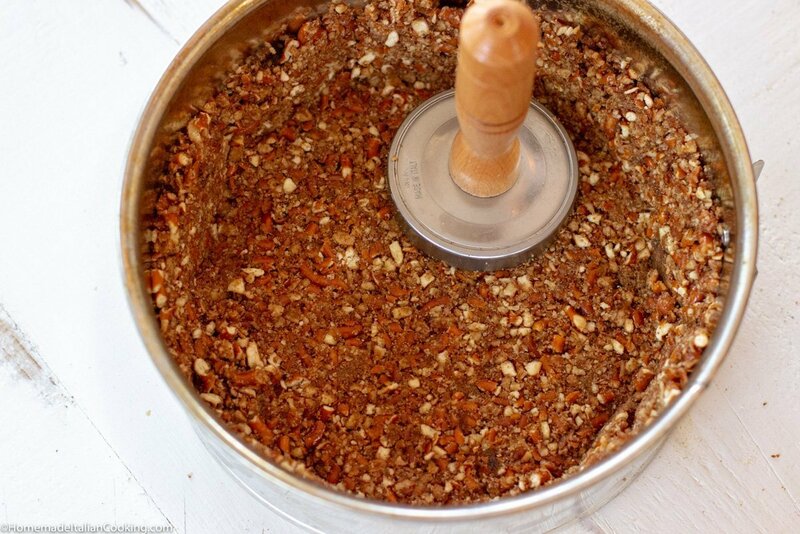 With a heavy meat mallet or the bottom of a heavy water glass, firmly tamp down the crust from the center and working up the sides to form a packed crust into a greased springform pan. Bake for 12 minutes at 350 degrees. Make the cheesecake filling in a stand mixer. Combine cream cheese, sour cream, peanut butter, brown and white sugar, eggs and vanilla until smooth and creamy. Pour into the cooled, cooked crust. Bake the cheesecake at 350 degrees for 20 minutes, then turn down the oven to 200 degrees without opening the oven door and continue baking for 1 1/2 hours or until the top is set and jiggle-free. Turn off the oven and let sit another 1 1/2 hours without opening the oven door. Remove the cooled pan from the oven and cover it with with saran wrap and chill overnight in the fridge for best results. When ready to frost and garnish, make the ganache with dark quality chocolate and heavy cream until smooth and glossy. Remove the cooled cheesecake from the springform pan and set on a cardboard circle or cake plate. Slowly pour the warm ganache over the cheesecake letting it drip down the side and creating a thick coat. While the ganache is still warm, carefully place handfuls of crushed pretzels on top for garnish. 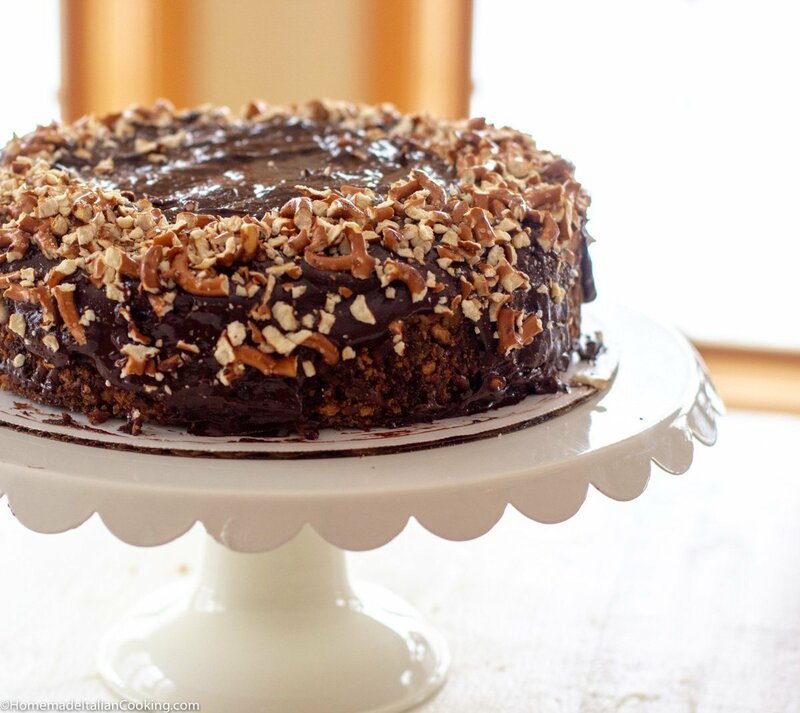 Serve a slice of Peanut Butter & Chocolate Cheesecake with Pretzel Crust with a strong espresso for dessert. Or eat right from the fridge at 2AM. I haven’t craved a Reese’s Peanut Cup for weeks after enjoying this cake. If you love Cheesecake as much as I do, try my two other cheesecake recipes; Chocolate Chip Cherry Cheesecake and Lemon Ricotta Cheesecake for special occasions! Set the cream cheese, sour cream and eggs on the counter for at least an hour to come to room temperature for easier mixing. When you are ready, preheat oven to 350°. Spray a 9-inch springform pan with baking spray, or brush with Baker’s Goop. Place springform pan on a baking sheet to catch any spillage. In a medium bowl, Combine crushed pretzels, melted butter, brown sugar and salt and mix until well combined. Transfer pretzel mixture to prepared pan. WIth the bottom of a heavy water glass or meat mallet, press the crust mixture firmly and evenly into bottom and up sides of the prepared pan. Press from the center and work your way out and up for best results. Bake for 12 minutes. Set aside to cool. Leave the oven set at 350 degrees. Place the room temperature cream cheese in a large mixing bowl of a stand mixer. Beat on medium low until completely smooth. Do not whip air into the cheese. Sift the brown and white sugars to remove any lumps. Add the sifted sugars to the bowl and continue mixing until smooth. Add the sour cream and vanilla extract. Continue mixing on medium low until well incorporated. Add eggs, one at a time, beating well after each addition. Add the peanut butter and mix until well incorporated. Overall this will take 5-10 minutes to fully mix the filling without whipping it. Transfer the filling on top of the cooked crust and spread evenly. Place pan in oven, and bake for 10 minutes at 350 degrees. Without opening the oven door, reduce the temperature to 200 degrees. Bake for 1 ½ hours, or until the center is firm and the cheesecake no longer looks shiny or wet. Keep an eye on the pretzel crust that it does not burn. Turn off the oven. Allow the cheesecake to set in the oven for another 1 1/2 hours. Remove from oven and cover the Springform pan with plastic wrap. Store in the fridge overnight to completely chill. Remove the cheesecake from the springform pan and transfer to 9-inch cardboard cake circle for easier handling. Place the circle on top a cake plate lined with parchment paper to catch the chocolate dripping. To make clean up much easier place cake plate on top of baking sheet to catch the crushed pretzels and mess. Heat cream in a small saucepan until simmering. 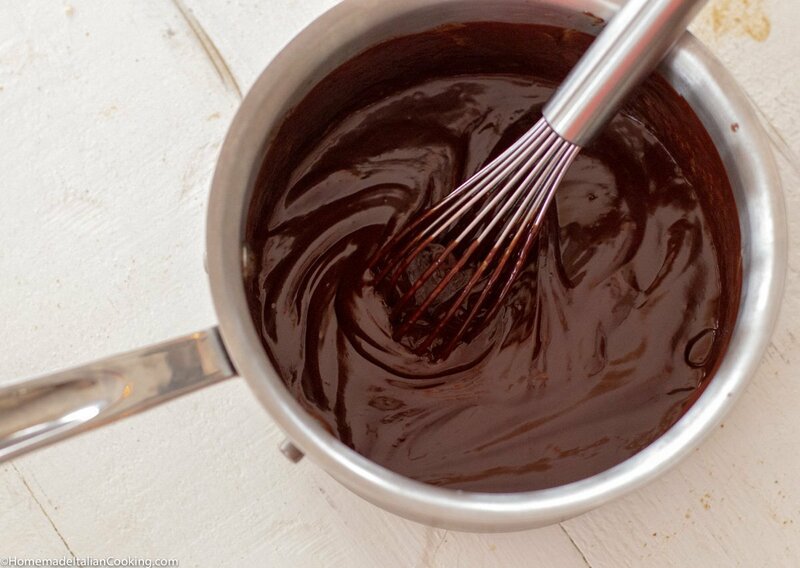 Off the heat add the chocolate and whisk together with cream as it melts. Pour onto top of chilled cheesecake and spread to the edges. Let it drip down. Spread the top with a flat spatula knife to smooth out. While still warm, Scoop handfuls of crushed pretzels and carefully garnish the outside edge of the cheesecake. Return cheesecake to the fridge until the ganache sets, at least 2-3 hours.